The Artist's Despair Before the Grandeur of Ancient Ruins (German: Der Künstler verzweifelnd vor der Grösse der antiken Trümmer) is a drawing in red chalk with brown wash executed between 1778-1780 by Johann Heinrich Füssli. 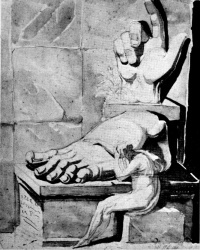 It shows a seated figure mourning beside the colossal hand and foot, part of a statue, namely that of the Colossus of Constantine at the Capitoline Museums in Rome. The work was acquired by the Kunsthaus Zürich in 1940. The artist's despair may be caused by "the impossibility of emulating the greatness of the past" (Writing Rome: Textual Approaches to the City), by the knowledge that all things must decay, or by a sense of unfulfilled longing and dislocation. Distortions of perspective and the "plunge into the abyss" (ibid) along the right edge conjure up a sense of nightmare. SPQR may be read in the inscription on the base of the foot, while vegetation sprouts up near the hand; the artist, in a "fit of melancholy", is dwarfed by the fragments of the past. Unless indicated otherwise, the text in this article is either based on Wikipedia article "The Artist's Despair Before the Grandeur of Ancient Ruins" or another language Wikipedia page thereof used under the terms of the GNU Free Documentation License; or on original research by Jahsonic and friends. See Art and Popular Culture's copyright notice. This page was last modified 20:37, 6 May 2014.